WASHINGTON, D.C. -- U.S. college graduates who majored in business are the least likely of those who majored in the four large major categories -- social sciences/education, sciences/engineering, arts and humanities, and business -- to express strong interest in the work they now do, regardless of what career path they may have followed after graduation. Fewer than two in five U.S. college graduates with a business-related degree (37%) strongly agree that they are deeply interested in the work they do, notably lower than majors in the social sciences/education (47%), sciences/engineering (43%) and arts and humanities (43%). These findings come from a large sample of college graduates of all ages, but even among recent graduates -- those graduating between 2000 and 2014 -- the patterns hold, with business majors slightly trailing all of the disciplines, though they are statistically tied with arts and humanities. More broadly, those who majored in business also lag by a substantial margin behind their academic peers in the critical area of purpose well-being. The Gallup-Healthways Well-Being Index defines this as people liking what they do each day and being motivated to achieve their goals. In contrast to clear majorities of social sciences/education (56%), sciences/engineering (54%), and arts and humanities (53%) majors who are "thriving" in their purpose well-being, less than half of business majors (48%) are thriving. Business is by far the most common field of study among undergraduates, with nearly a fifth of all college graduates saying they majored in this subject. These results are based on the inaugural Gallup-Purdue Index, a joint-research effort with Purdue University and Lumina Foundation to study the relationship between the college experience and college graduates' lives. The Gallup-Purdue Index is a comprehensive, nationally representative study of U.S. college graduates with Internet access; according to a 2013 Census Bureau report, 90% of college graduates in the U.S. have access to the Internet. Gallup conducted the Web study Feb. 4-March 7, 2014, with nearly 30,000 U.S. adults who have received at least a bachelor's degree. Based on respondents' self-reported college major(s), majors were grouped into large categories. Graduates with more than one major were included in each of the relevant categories. Doing postgraduate work is generally associated with higher purpose well-being -- 47% of those with a bachelor's degree are thriving in their purpose well-being, compared with 61% of those with postgraduate studies. Students of certain majors are more prone to continue their education. For instance, nearly half (46%) of all social sciences/education majors report having done postgrad work, the most of any major field. Business majors, by contrast, are the least likely of the four large categories to have done postgraduate work -- about a fifth (22%) report having done so. Given this low propensity to advance up the academic ladder, a natural hypothesis as to why business majors have relatively low purpose well-being and career interest is that most business students decide against pursuing postgraduate studies. Business majors with postgraduate education are far more likely to be thriving in their purpose well-being (56%) than are business majors without such education (46%). But business majors still exhibit a lower level of thriving in their purpose well-being compared with those who studied other subjects after college, including the social sciences/education (63%), sciences/engineering (63%), and arts and humanities (62%). Likewise, postgraduate education is predictive of strong interest in a person's work, all other things being equal -- 52% of those in this group strongly agree that they are deeply interested in their work, compared with 38% of individuals who have only an undergraduate degree. However, among those with postgraduate education, business majors remain less likely than other college majors to strongly agree that they are deeply interested in their work. 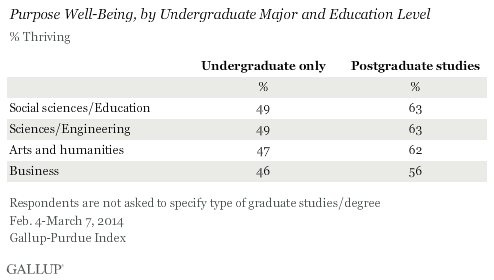 Furthermore, there is little difference between business majors with postgraduate studies and those without such credentials in terms of expressing a strong interest in their work -- 43% vs. 36%, respectively. By contrast, those with postgraduate studies in other majors are far more likely than their undergraduate-only counterparts to say they are strongly interested in their work. Despite the perceived marketability of business fields that should help boost a person's earning potential, business majors do not enjoy clear leads over other majors in the area of financial well-being. The Gallup-Healthways Well-Being Index defines financial well-being as how well one manages one's economic life to reduce stress and increase security. Sciences/Engineering majors are ahead in this important metric: nearly half of all such majors (48%) are considered thriving. Business majors fare about as well as social science majors, at 43% and 42%, respectively. Arts and humanities majors are the least likely to be thriving financially (39%), and this may be one reason that demand for humanities-oriented undergraduate degrees has reportedly fallen. For example, Harvard University has reported a 20% drop in humanities majors in the last decade. Recent graduates demonstrate a similar tendency, with sciences/engineering majors most likely to be thriving financially (35%). But among this group, business majors are better situated relative to social sciences/education and arts and humanities majors. Business is a popular field among undergraduates -- indeed, even among postgraduate degrees, business administration (MBA) is the most commonly awarded. A field that studies the inner workings of the American economy, majoring in business may seem like a sound decision in order to position oneself for maximum career opportunities. But as The Gallup-Purdue Index shows, business majors do not outperform other majors in important metrics that ensure graduates have "great jobs" and "great lives." Business majors finish behind the pack in terms of work interest and purpose well-being. Even in financial well-being, sciences/engineering majors eclipse business majors, and social science/education majors are on par with them. The Gallup Panel is a proprietary, probability-based longitudinal panel of U.S. adults that are selected using random-digit-dial (RDD) and address-based sampling methods. The Gallup Panel is not an opt-in panel. The Gallup Panel includes 60,000 individuals. Panel members can be surveyed by phone, mail, or Web. Gallup Panel members with a college degree, with access to the Internet were invited to take the Gallup-Purdue Index survey online. The Gallup Daily tracking survey sample includes national adults with a minimum quota of 50% cellphone respondents and 50% landline respondents, with additional minimum quotas by time zone within region. Landline and cellular telephone numbers are selected using RDD methods. Landline respondents are chosen at random within each household on the basis of which member had the most recent birthday. Gallup Daily tracking respondents with a college degree who agreed to future recontact were invited to take the Gallup-Purdue Index survey online. 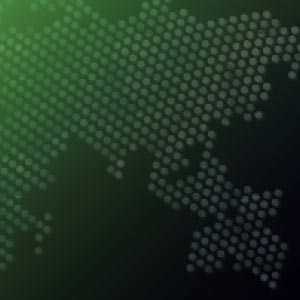 Gallup-Purdue Index interviews are conducted via the Web, in English only. Samples are weighted to correct for unequal selection probability and nonresponse. The data are weighted to match national demographics of gender, age, race, Hispanic ethnicity, education, and region. Demographic weighting targets are based on the most recent Current Population Survey figures for the aged 18 and older U.S. bachelor's degree or higher population. For results based on the total sample of college graduates with a bachelor's degree, the margin of sampling error is ±0.9 percentage points at the 95% confidence level. Half of 2000-2014 black college graduates in the U.S. report graduating with more than $25,000 in student loan debt. Black college grads show lower levels of well-being in several areas compared with other college graduates. A majority of American workers, 55%, get a sense of identity from their jobs, a finding consistent over time. College graduates are more likely to get a sense of identity from their job than non-college graduates.